In continuing to develop the Kentucky Renaissance Pharmacy Museum, we are extremely interested in donations of any and all accouterments of pharmacy practice. Amber glass stoppered bottles with gold labels for tinctures and elixirs, white glass for waters and syrups and special blue bottles for poisonous medicinals, ointment slabs, a pill rolling machine, a sterilizer, and a hand operated typewriter, the list is never ending. All of the items have been part of historical standard equipment and have disappeared as our profession remodeled to accommodate for the ‘computer’ age. We must make every effort to preserve these items for future generations and they must be preserved and maintained in our state and for our profession. 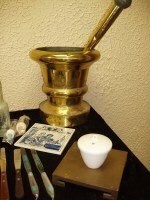 To appropriately exhibit these items, the Kentucky Renaissance Pharmacy Museum is seeking appropriate period showcases. 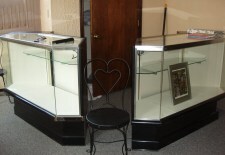 We were fortunate to secure some inexpensive cases from a non-pharmacy business that was remodeling. This has permitted us to open the first room and to promote more widely our need for more traditional display cabinets consistent with the period of the pieces being displayed. The Kentucky Renaissance Pharmacy Museum asks the members of our profession and others for assistance in helping the Museum locate and secure the period display cabinets and other apothecary cabinetry. If anyone is aware of either a single period display cabinet or a full pharmacy that has been dismantled and stored away in a business attic or storage shed, we would like to speak with these individuals to discuss possible contributions or purchase. 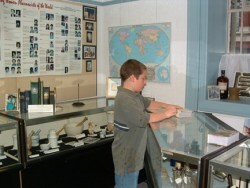 Since our museum is a non-profit 501(3) (c) organization, such donations would be tax deductible. From those individuals with an interest in preservation and history, we are asking that they consider supporting the Kentucky Renaissance Pharmacy Museum by volunteering and with monetary contributions. Contributions permit active negotiation for appropriate pieces should they be held by individuals who do not have a vested interest in preserving the history of our profession within our state. Very succinctly, monetary support is needed to continue our museum's efforts in preparing various rooms as well as preserving and presenting our profession’s heritage in the way that best depicts our mission. It is also appropriate that we seek methods to perpetuate the Kentucky Renaissance Pharmacy Museum as we continue to establish the displays. In that effort we are seeking assistance in writing grant requests. If you have experience in writing grants, your assistance would be greatly appreciated. We look forward to you visiting our profession’s museum, the Kentucky Renaissance Pharmacy Museum and hope that you will be motivated to support our efforts in the ongoing preservation of Kentucky pharmacy history. concerning its history for public information.